The Elder Scrolls Online (ESO) just got its third DLC pack and its first meaty expansion in the Thieves Guild DLC, which launched today. If you’re in the mood for some different online role-playing, why not check out our list of PC’s best MMORPGs. The new DLC lets you join the Thieves Guild of Abah’s Landing and work your way up through the seedy ranks of burglars, pickpockets and unauthorised borrowers. 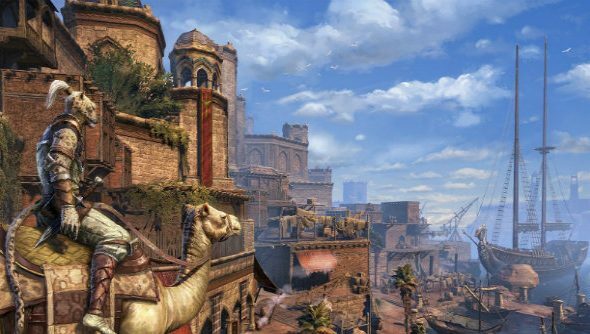 Its quests will take you to an all-new zone called Hew’s Bane – a dusty, rocky, Arabian-style area located in the southern peninsula of Hammerfell – and you’ll also go through familiar Tamriel territory in your search for other people’s treasures. There will be unexplored delves, powerful group bosses, heists, a new 12-player trial, a new skill line, exclusive rewards and more. Thieves Guild is included with an active ESO Plus membership or will be available for 2,000 crowns via the ESO Crown Store.